Joseph and the Amazing ________. Jesus was born in a _____________. He raised from dead on the _____ day. In our culture, many people were raised with these stories and took them as truth. You either grew to understand the context of the stories, or you grew to doubt. Science, logic and history may have contradicted the Sunday School version of the Bible that you knew. In fact, you may have come to doubt if you can trust the words in the Bible. How Did The Bible Become The Bible? 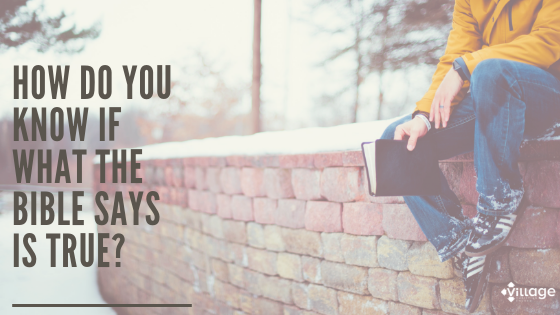 Before we can determine if the Bible is reliable, we have to ask, how did the Bible become the Bible? I mean, who wrote it? And why? God didn’t write it. Jesus didn’t write it. So, where did it come from? Historical documents and secular scholars agree that Jesus existed and was executed on a cross, but the story of “The Bible” does not begin in Genesis and it doesn’t starts with His birth. The story of the BIBLE starts when the women show up at an empty tomb. When hundreds of people see Jesus ALIVE in Jerusalem after he was killed publicly on a cross and buried. The resurrection was THE NEWS STORY of the first century. The Bible actually begins BECAUSE of a doctor named Luke. He was not Jewish, but Greek. He was asked to write a document for Theophilus, a wealthy man that had heard many stories of Jesus, from many different disciples. Luke had heard enough stories and met enough of the eye witnesses that he had put his faith in Jesus. So, He asked Luke to give him “the full story”. It’s unusual that more than one account occurred of same event. In ancient times there are virtually no multiple accounts of the same event. The life of Jesus actually stands out in history simply for the fact of multiple written accounts of his life. Luke tells us about Mary. Have you ever wondered how we know what the angel said to Mary? It’s because Luke interviewed her. He tells us about all kinds of details, that’s how doctors are. He tells us the name of the person that paid for Jesus’ burial, and many more details that seem insignificant, but are important to the actual proof of life. It was expensive and unusual to write back then. Most people were illiterate. There are so many accounts because SOMETHING HAPPENED. We know that 4 of the disciples accounts ended up in this. Mark was short, to the point, and full of action. Matthew, a Jew, was saying trust me – Jesus is the Messiah we have been looking for. Luke admits that he is not the only one. John was old, why write it? John’s account is all you need. If this is all you ever read, you ever know, this is enough. In addition to all of the accounts of Jesus’ life from his closest disciples, there are also a lot of writings that end up in the Bible. In addition to his account of Jesus’ life, Luke also wrote an account of the first 30 years in the life of the Church, which we call the book of Acts. Luke knew Peter, John and Matthew, he also knew James, brother of Jesus, and he really knew Paul. He traveled and planted churches with Paul. Secular historians agree that the writings of Paul shaped the culture of western civilization. 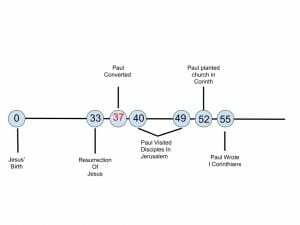 Paul was more than just a Jesus follower and church planter. He explains how Christians should use the Old Testament, for inspiration and motivation, not application. 1. He wrote some of it. 2. He explains the relationship between the parts. 3. He authenticates the resurrection. Some secular scholars dispute the Gospels, their timeline and authorship. They say that Christians made up the story of the resurrection after everyone that could deny it was dead, and then wrote these Gospels to give credence to their made up religion. There are so many historical reasons this doesn’t make sense. Paul’s letter to Corinth is INDISPUTABLE evidence that Jesus’ resurrection was accepted as fact IMMEDIATELY. Nobody disputes that Paul wrote the document we call 1 Corinthians. Nobody disputes that he wrote it about 55 AD, 3 years after he planted the church in Corinth. Jews, Gentiles, then PAUL and Greeks, Romans, all kinds of ethnic backgrounds were hearing about Jesus. ● They wanted to know about the God that had a son Jesus, what was the back story, and the prophecies. ● These people didn’t want to learn from the Jews, who had messed it up and didn’t recognize him. ● The Hebrew Scripture was called Law & Prophets. This brings us to the end of the 2nd century and there is still no Bible. There are thousands of Christians – Greek Christians, Jewish Christians, and Roman Christians. There were thousands of copies of these documents. Very soon the copies of the Matthew, Mark, Luke, and John in the 2nd and 3rd century were called Gospels and scripture. 270 years before THIS BOOK is ever assembled. Then late 4th century, Constantine the Roman Emperor made Christianity the preferred religion. This was the first time ever that Christian scholars were able to work in the open. They compared copies of the Jewish literature and Christian literature. In fact, the Roman empire that executed Jesus funded the formation of the 386-388 Ti Biblia. Why would a group of Jews, create a new religion about the Jewish God, that caused other Jews to want to kill them? Better yet, why would a bunch of Greeks, that didn’t believe in the Jewish God, abandon their gods to join a Jewish sect that was HATED by the Jews? Why would rich men spend all of their money to create written documents about a Jewish rabbi and carpenter? Why, today can an illiterate man in a third world country come to share the same faith as me? Secular scholars and Biblical Scholars all agree that the texts written about the happenings that occurred in 33 AD changed and shaped all of Western culture. People died to protect the writings that became THE BIBLE. If we believe in the event that compelled the Bible to be written, then and only then, we can have hope its message. So my question is: Do you believe Something Happened In 33 AD? And if you do, you owe it to yourself and to everyone you know, to consume the stories, understand the contexts and share your love of this book! Our staff is here to help. Please email them or call 815-467-2265 with your questions. © 2019 The Village Christian Church. All rights reserved.